A £145m project to take a Docklands Light Railway (DLR) line under the Thames has won government approval. An extension is currently being built to North Woolwich from Canning Town via London City Airport. The latest plan will add a further 2.5km to take the DLR to Woolwich Arsenal. It is expected to be completed by 2009. Mayor Ken Livingstone hopes it will play a large role in regenerating south-east London by creating better links to Canary Wharf and the City. Financial backing has not yet been secured, but DLR Ltd is in the process of selecting a private sector "concessionaire", which would pay the immediate infrastructure costs. 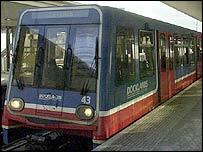 They would be repaid over a number of years by DLR by using money from fares. Work to extend the line by boring tunnels beneath the Thames and building a new station at Woolwich Arsenal is expected to start in 2005 and be finished by the end of 2008. Minister for Transport Tony McNulty announced approval of the plans on Thursday. Mr Livingstone described it as "excellent news" adding: "A DLR extension to Woolwich Arsenal would link Woolwich with the employment hub of the Docklands."